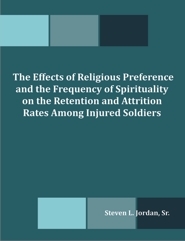 The Effects of Religious Preference and the Frequency of Spirituality on the Retention and Attrition Rates Among Injured Soldiers ; Steven L. Jordan, Sr., Ph.D.
by Steven L. Jordan, Sr., Ph.D. Using a quantitative causal-comparative approach, the researcher conducted a relational study that compared injured and rehabilitated soldiers with no religious foundation to similar soldiers possessing religious preferences and spirituality. The two primary research questions were (a) Does religious preference and spirituality have a positive impact on the retention and attrition rates of injured soldiers? (b) Does an injured soldier’s frequency of spirituality increase the likelihood of being returned to initial-entry training? The study addressed several possible variables; among these were the importance of religious preference and spirituality in returning injured soldiers to training; the determination of a soldier’s level of spirituality and its healing impact; spirituality’s effect on the injured soldier’s psychotherapy, and other related demographic factors.